The New catalogs are off and running! Come and check out some of the great new products, free Make’N’Takes, refreshments and check out some cook sample cards. Get your coupon sheet with coupons for each month of the year, get the first crack at my retired products (10% off) and if you haven’t picked up your complimentary copy of the 2011 – 2012 Stampin’ Up Idea Book and Catalog, do it on the 16th! And such cute Make’N’Takes!!!!! This is one of the new sets – Cherish Friendship – and we will be using watercolor pencils and odor free mineral spirits. It is unbelievable the blending you can achieve with mineral spirits! 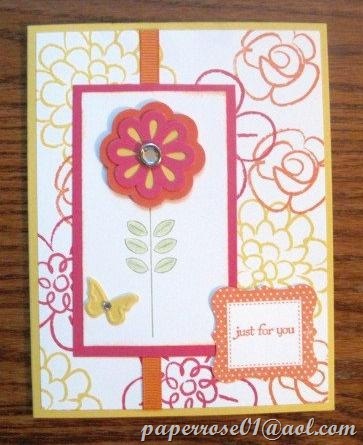 This makes such a cute gift card or just a thoughtful touch! 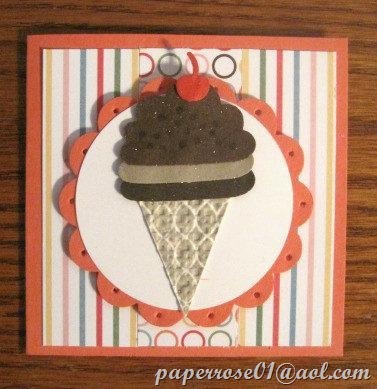 Next come the ice cream cones! I had so much fun with my flavors and the new Calypso Coral cs! 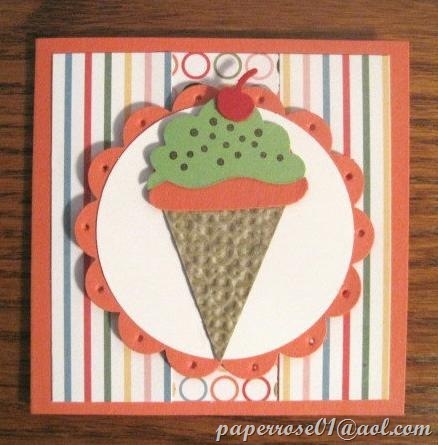 First I fixed a double berry cone followed by an orange and lime sherbet cone – Yummy! Next came the raspberry ice followed by the absolute best triple chocolate treat! And you know what, these aren’t Weight Watcher cones, but they have absolutely NO CALORIES! The DSP is really cute – Just Add Cake. PLUS, except for the sprinkles, all of this is PUNCHED!!!! 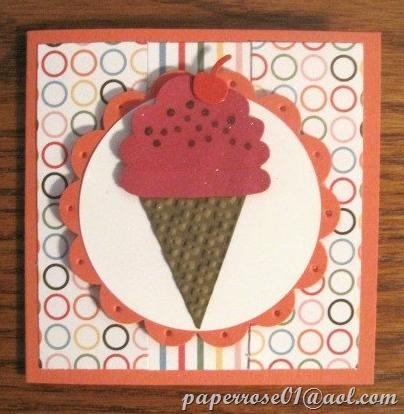 We use the new Petite Pennants Builder punch and the Cupcake Builder Punch! These are just too cute! What “flavor” ice cream will you scoop? 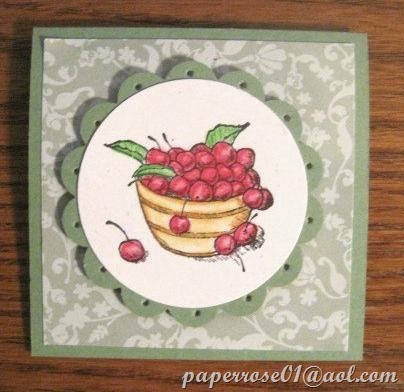 Finally comes Flower Fest – an absolutely cheerful stamping delight! 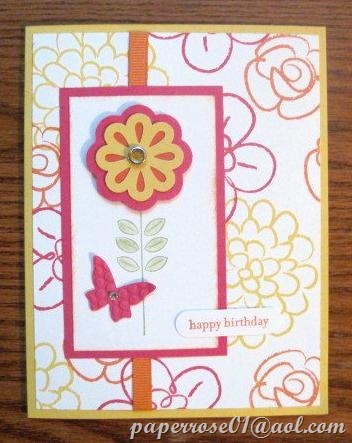 And – you get to play with the Blossom Bouquet Triple Layer Punch! I love this new punch – 1 punch with 3 different punch shapes. 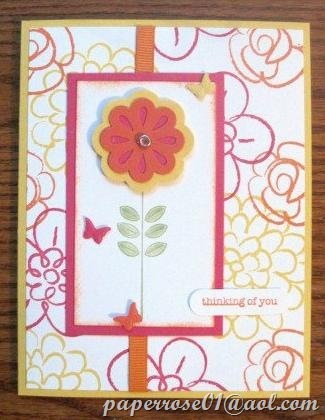 I did 3 samples and using the same paper, came up with 3 different flower combinations. I used butterflies because – well – I just love butterflies. I added little rhinestones on 2 of the butterflies to carry through the bling from the flower centers. So come on over any time on the 16th! 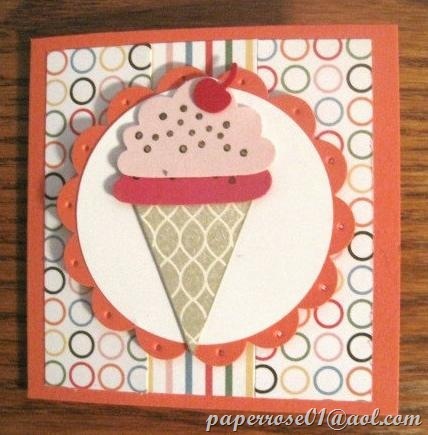 Grab your coupon sheet (only available on July 16th), your catalog, have a bite to eat (I’m cutting up watermelon and cantaloupe) and make a card or 2 or 3! No pressure – I promise I won’t sing. Just come and have fun. Give me a call or drop an E-mail if you have any questions: 630-759-3089 – www.paperrose01@aol.com – 533 Emerson Circle!